As farms continue to consolidate it becomes increasingly important to assess a farm’s management skills. At a certain farm size, it is no longer easy or feasible for the manager or managers to wear every management hat. How does the management team determine when to focus on professional development, delegate management tasks among mangers, and seek outside assistance? This is the first article in a series of articles pertaining the assessment of management skills. The topic of this article is the assessment of production management skills. Before discussing production skills and gaps, it is imperative to discuss the importance of production or technical efficiency to productivity. Improving productivity is critical to improving financial performance and for farm growth. Productivity growth is a function of changes in input use, technical change, and technical efficiency change. Technical change measures an upward shift in the production frontier (i.e., output to input ratio). Technical change occurs when output (e.g., corn production) increases faster than inputs (e.g., seeding rate, N rate, etc.). Technical change typically results from the adoption of technologies such as new machinery or a new seed variety. Technical efficiency change measures a farm’s ability to produce on the production frontier or at maximum output given the level of aggregate input. If technical efficiency on a particular farm or the relative efficiency of a specific farm to leading farms erodes, it will difficult for the farm to achieve adequate financial performance or to grow. Table 1 presents important production management skills. Skills listed include use of technology, cost of production per-unit of output, improving production skills, adjusting production to environmental changes, use of field records, written production plans, and benchmarking. Each farm operator should rank their ability with respect to each skill using a 1 to 5 scale with 1 be relatively weak and 5 being relatively strong with respect to that skill. 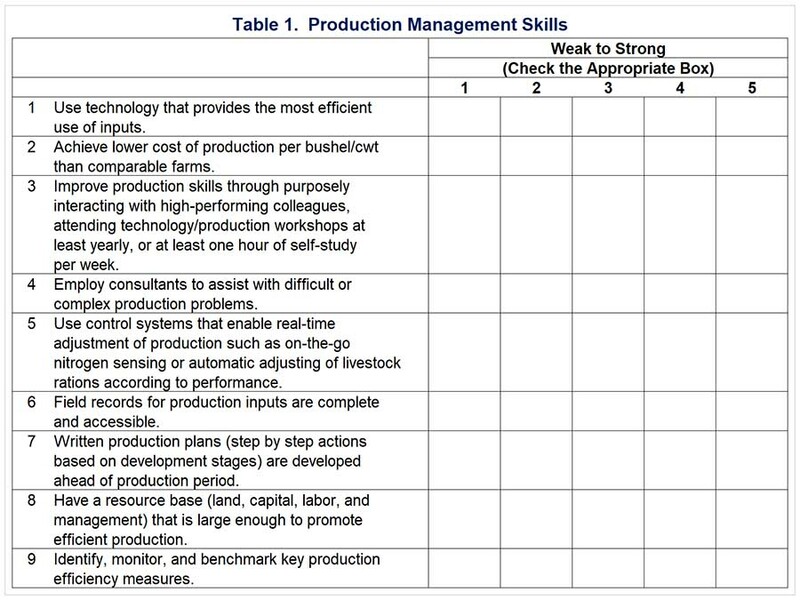 The idea behind checklists such as that presented in table 1 is to assess whether a farm has a skills gap, which is defined as the difference between skills that a farm needs and the skills of their current workforce (operators and employees). Conducting a skills gap analysis helps a farm to identify skills that will be needed to become more efficient and expand. It can also be an important input into hiring programs, employee development plans, or hiring outside consultants. A recent farmdoc daily article (September 7, 2018) discusses the importance of benchmarking production and financial measures. In this article, the focus is on production benchmarks. For crop farms, production benchmarks would include crop yields, seeding rates, fertilizer rates and timing, planting dates, and harvest dates. Examples of livestock production benchmarks are as follows: feed conversion, average daily gain, pounds of milk per cow, weaning weight, percent calf crop, and eggs per hundred layers. Production benchmarks have a large impact on production costs per-unit of output. For example, relatively high crop yields often lower per-unit costs. However, this is not always the case. Relatively high production may correspond to relatively high per-unit cost. Thus, a farm needs to benchmark both production and per-unit costs. Timing of inputs is also important. For example, does applying nitrogen during the growing season lead to higher production and lower per-unit cost compared to applying all of the nitrogen pre-plant? Utilizing key performance indicators is an important ingredient in creating an environment that stresses continuous improvement. The right set of key performance indicators help a farm evaluate performance and highlight areas that need more attention. Key performance indicators may focus on past and expected performance. Many economists would argue that the most important costs are forward looking rather than historical. What do they mean by this? Pro-forma income and cost projections are essential planning tools. We would rather know ahead of time whether net returns are going to be well below or well above projections made early in the crop or livestock year. Net returns that are well below original projections may require changes in debt repayment schedules and change how a farm purchases inputs and sells products before the next crop or livestock year. On the other hand, net returns that are well above original projections, may impact both input and output decisions, as well as have an impact on major investment decisions such as purchasing machinery or land. Langemeier, M. "What Should My Farm Benchmark?." farmdoc daily (8):167, Department of Agricultural and Consumer Economics, University of Illinois at Urbana-Champaign, September 7, 2018. Marr, B. “Key Performance Indicators: The 75 Measures Every Manager Needs to Know.” London: Pearson Education, 2012.